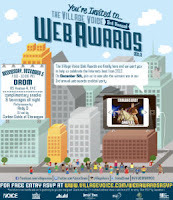 The Village Voice is soliciting your nominations for their annual Web Awards. There's the usual mix of funky categories like "Tumblr Rant Of The Year" and "Best Twitter Parody Account." (My vote for the latter category goes to El Bloombito.) The category likely to get the greatest response is Best Viral Video, where I'd expect lots of nods for Chatroulette Call Me Maybe and Gangnam Style. As for Meme Of 2012, we'll probably see of a lot of Romney-themed action. Binders! 47%! 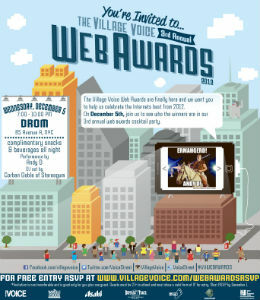 Check out the categories and give us your own recap for 2012.